I’ve mentioned before that I love coming back to the homestead after being gone a few days. There are so many new things growing when I come back! Along with a few peppers, I found this contraption on the side of the house when I returned from my sister’s bachelorette party. Ray and I have had the materials to build a rain barrel since June but we’ve been so busy there has just been no time to get to it. On days when it is pouring rain, I look wistfully out at the moat around our house wishing we had just taken a few hours to put it together. And now, with me out of the way for a few days, Ray managed to install it! 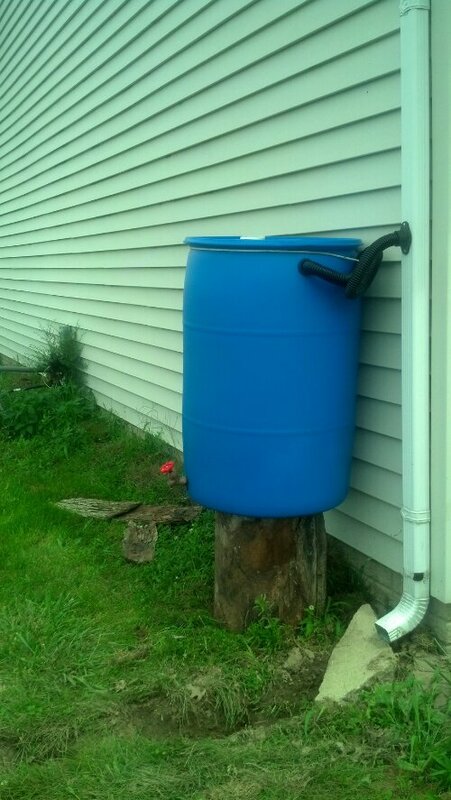 Why a rain barrel? With a rain barrel, we can harvest rainwater for our garden rather than pulling from the well. This way, we make good use of it before it reaches the aquifer that feeds our well. Rainwater is the best irrigation for gardens because it is free of added chemicals such as chlorine and fluoride and there are no dissolved salts and minerals from the soil in it yet. Stay tuned for a “how to” post with more information after we put together our second rain barrell!